Summer rentals are always from Saturday to Saturday 12h 16h. The apartment has a large lounge with sea views, pool and mountains. Privacy and relaxation. Private heated pool, water at 30 degrees, ideal for couples, any eventual change, in the number of people or bring animals, should be consulted previously and always outside the peak season. Decreasing prices depending on the stay of two or more weeks. Rest of the year can be rented monthly to come spend the winter, prices are on application, may vary depending on the length, between 1000 and 1400 euros per month. We tourist and cultural information, advice and assistance to people in other countries. General Hospital and all amenities 2 km. Inglés: The summer holiday is always from Saturday to Saturday 12h 16h. Rentals are from Saturday to Saturday During the summer, check in 4pm and check out 24:00. The apartment has a large living room overlooking the sea, the swimming pool and the mountains. Privacy and relaxation assured. Private heated pool, water at 30 degrees During the summer, swimming pool Might Have to be shared with two other people. Free Wi-Fi internet. Discounted stay for more than two weeks. Prices on request for staying's in the winter, They May vary Depending on the duration, Between 1000 and 1400 euros per month. Tourist and Cultural information, advice and assistance to people from other country clubs are Given. Hospital and all amenities close by, around 2 km from the house. Français: Les locations de vacances en sont toujours été du samedi au samedi 16h 12h. L'appartement dispose d'un grand salon vu sur la mer, la piscine et la montagne. Intimité et détente sont assurées. Piscine privée climatisée, l'eau 30 reste à degrés pendant I l'été. La piscine peut être utilisée par deux autres personnes occasionnellement, mais toujours in accord avec les pour plus d'intimité locataires. ADSL, Wi-Fi et dans la propriété parking. Réduction séjours pour les semaines de plus de deux. Reste de l'année BUPA louer par mois, come passer pour l'hiver, les prix sont à consulter et en fonction des mois varient of permanence, between 1000 and 1400 euros par mois. Donnons des conseils et Nous l'aide aux gens dans d'autres pays. Hôpital général et à toutes les moins commodités 2 km. Very close to Salobreña and Almuñecar, with more than 3000 years old, Phoenician, Roman and Arab ruins. The owner can inform you of walks and visits. 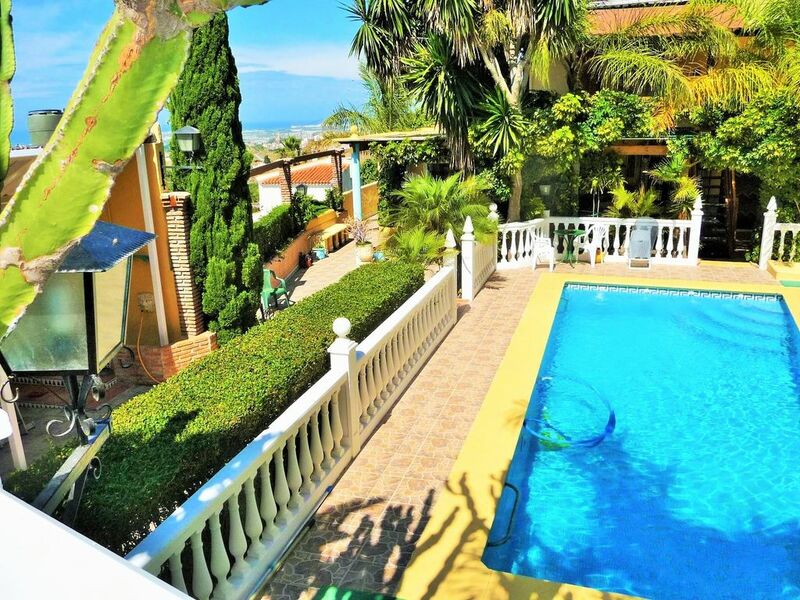 An hour and a half from Malaga airport. Take the motorway towards Motril-Almeria, exit Motril. Once here call by phone and we will go down to look for you. To get directly to the property, Mark in GPS: "Alojamiento Rural Villa del Este". From Granada, Almería and Málaga, the free A 7 motorway arrives directly at Motril. We are 2 km from the city center and 140 meters above sea level.